FRANKFURT, GermanySoundcraft and Shure today announced a new collaboration that enables native monitoring and control of select Shure wireless systems on Soundcraft Vi Series digital consoles. The initial implementation is being showcased at Prolight + Sound, where the new Soundcraft Vi5000 and Vi7000 Digital Mixing Consoles support Shure's ULX-D® and QLX-D™ Digital Wireless Systems. With the introduction of the Vi5000 and Vi7000 Consoles comes the new extension to the Vi's patent-applied-for VM2 radio microphone status monitoring feature, with Shure's digital wireless systems now recognised alongside AKG's DMS800 and WMS4500 systems. This integration enables automatic Shure device discovery, identification, and mapping of each wireless system to the appropriate mixer channel. When that channel is selected on the console, all essential wireless parameters are displayed. This enables live monitoring of the channel's RF and audio metering, with the ability to adjust receiver gain from the console, much like trim adjustment for a wired mic. In addition, battery life status for Shure rechargeables and standard AA alkalines is supported. "We are very pleased to be collaborating with Soundcraft to enable remote monitoring and control of networked Shure wireless systems," said Shure President and CEO Sandy LaMantia. "Providing the essential wireless functions within the console inspires user confidence and adds value to both systems by providing a more seamless, integrated experience." Dave McKinney, General Manager and Vice President of Soundcraft and Studer notes, "The Vi Series consoles are designed to deliver the features and technology that our customers demand, so collaborating with Shure to deliver wireless data, natively and automatically, was an easy decision as it creates a smoother workflow for our users – something we are always striving to achieve." Models ULX-D and QLX-D are two of the newest digital wireless systems from Shure. Both use Ethernet connectivity to deliver system data to Soundcraft Vi Series consoles. 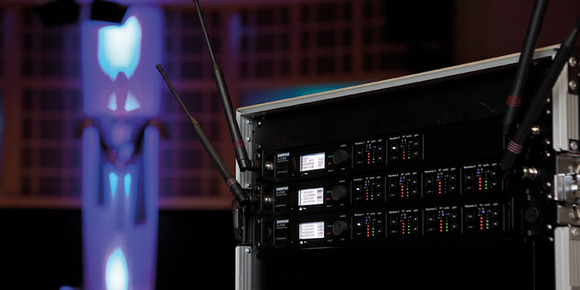 ULX-D Dual and Quad systems also offer networked digital audio connectivity via Dante. The new functionality is initially only available on the Vi5000 and Vi7000 consoles; A software update supporting Shure wireless integration will be made available to other Vi console models in the future, including Vi1 and Vi3000. Founded in 1925, Shure Incorporated (www.shure.com) is widely acknowledged as the world's leading manufacturer of microphones and audio electronics. Over the years, the Company has designed and produced many high-quality professional and consumer audio products that have become legendary for performance, reliability, and value. Shure's diverse product line includes world-class wired microphones, wireless microphone systems, in-ear personal monitoring systems, conferencing and discussion systems, networked audio systems, award-winning earphones and headphones, and top-rated phonograph cartridges. Today, Shure products are the first choice whenever audio performance is a top priority.